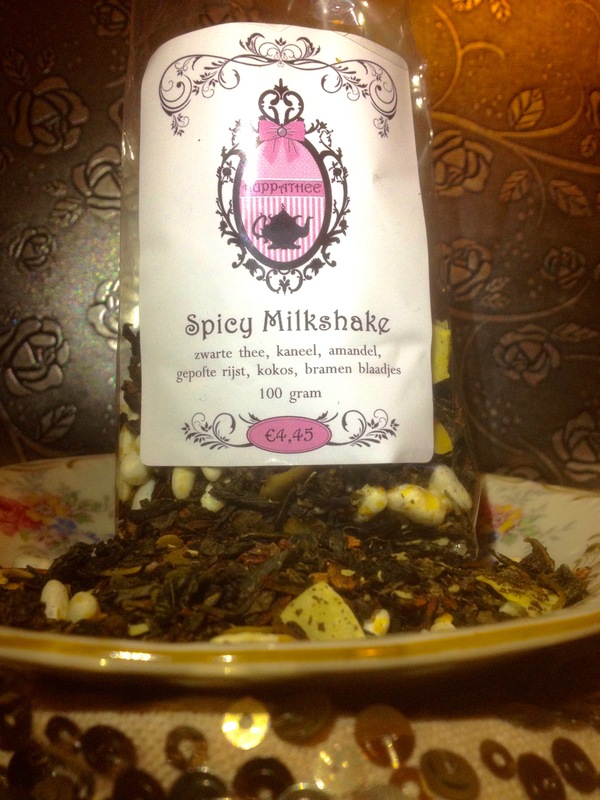 The name of this creamy tea mixture is Spicy Milkshake. When I first smelled this tea I was like: “Hmmm, spicy but what is so spicy about this tea”. Usually when I read spicy, I think of pepper or a very peppery pungent taste but not spicy as in spices. When tasting this tea, it’s the latter. The meaning of spicy here means many different spices that resonate in its smell and taste. Well, it smells like all different types of fragrances and essences. It smells like an intense almond perfume. It smells like a sharp cinnamon clove. Although all of these smell divine *will I ever get tired of using this word, probably not* I miss the perfect blend of tea such as black and green tea. Ever since I bought this tea, I am drinking it non-stop. I am now attempting a detox eating manner meaning that, *in my way*, I am eliminating all processed food, snacks, and candy. So when I smell a candy-like aroma packaged in loose leaf tea. It’s the closest I get to something candy, and it’s Ooh La La! The loose leaf tea is packaged in a simple, transparent plastic bag with two white stickers on the front and back with a detailed description. In front, it’s decorated with black floral vectors, a black tea-pot, a pink bow, etc. I bought this tea at Hooghuys Delicatessen in Zaandam *Yes, it’s near Primark!! * I have always loved the dreamy Christmas like feeling I get when I visit Zaandam city. It feels as if I’ve landed in beautiful fantasy land. I wouldn’t think of another store that would add value to this fantasy-like town and this store did. I entered the store carrying my Primark shopping bag and got a very pleasant service. Usually when I enter shops like these, I get treated as if the staff is waiting for a better customer to come. They make me feel as if I’m not good enough to enter such a store. However, I did not get this feeling when entering this store. It felt incredible. I came in and got offered a warm cup of tea and spicy chocolate nuts *pepernoot*. Adhering to my detox diet and my limited time I painfully declined but I would oh-so-love warm tea and pepernootjes hmmm. I observed the different type of teas and while doing that the clerk told me how you can prepare delicious meals with these aromatic teas. I also think that a true lover of tea is where you can clearly see that, that person enjoys talking about it instead trying to sell this drink. I loved that. Would I visit Hooghuys Delicatessen again? Well, if my Spicy Milkshake is finished I’ll go again.